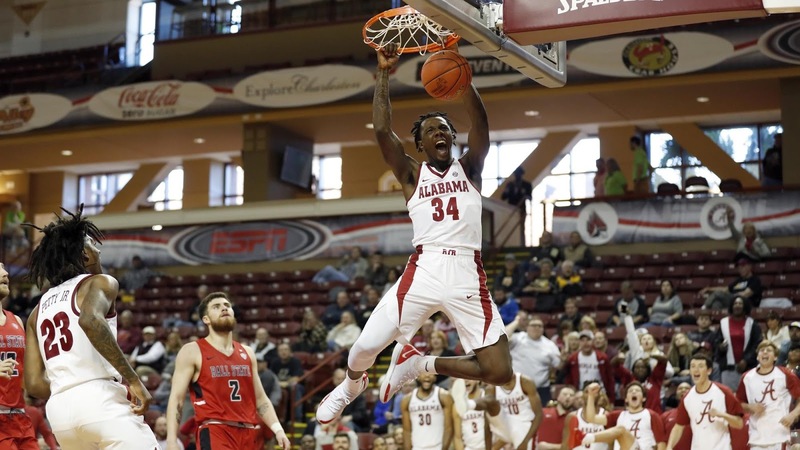 After a disappointing day one in Charleston, the Alabama men's basketball team bounced back with a 79-61 win over Ball State. It was by far the best performance of the young season for the team. The hope is we will see more of that Alabama team on Sunday, following a day off. Alabama will play their final game in Charleston against a familiar opponent: Wichita State (KenPom: 84). It will be the sixth time in nine seasons that the two programs have met. The Shockers hold a 3-2 advantage in the previous games during that span. Game time on Sunday is 12:30 P.M. CT. The game will be televised on ESPNU. My Two Cents: Greg Marshall has built Wichita State into a national program. Since winning the 2011 NIT against you know who, the program has gone to seven straight tournaments, and has moved from the traditionally one-bid Missouri Valley Conference to the multi-bid American Athletic Conference. The Shockers are expected to be in rebuilding mode this season. A 2-2 start would seem to suggest that's the case, with one of those losses being a home loss to Louisiana Tech to open the season. But the Shockers also have a neutral court win over Providence, they have Greg Marshall on the bench, and they have a loyal fanbase that travels. Put all of that together and Alabama will likely be in for another battle on Sunday in what could feel like a road environment to our guys. For Bama, the performance over Ball State was encouraging; I saw a lot of toughness and leadership on display in what was a must-win game. The question now is how will this team respond following a day off? Sunday is a big day for both teams as their respective coaching staffs try to sort through their rosters, determine roles, and build a team that can improve from now until March. Leaving Charleston with a second win would do wonders for the confidence of either team. Players to Watch: T-Mack! After a modest start, the transfer from Texas and South Carolina native finally broke out vs Ball State. Tevin Mack had a reputation as a scorer when he came to Alabama, and that was on full display on Friday as he hit 5-9 from 3, had a dunk off a steal and assist in the open floor, and had a great finish at the rim that resulted in an "and-1". When I looked at the potential for this Alabama team in the summer, the ceiling I saw for them always involved Mack being a key player on this team. The hope is that Tevin seeing the ball go through the hoop many times on Friday is just what he needs to get going. I watched Wichita State's game with App State on Friday, and was impressed by how senior leader Markis McDuffie took over the game late in the Shockers 82-76 win. He knocked down three 3-pointers in the final six minutes to help Wichita State avoid the loss. So far, McDuffie has been a star for the Shockers. Through four games he's averaging 20.5 ppg (51% from 3) and 3.3 rpg. Alabama's defensive gameplan should have McDuffie at the very top. Prediction: Avery Johnson has forgotten more about basketball than I'll ever know, but I was pleased to see him finally go with a small line-up for long stretches on Friday. Nothing against Galin Smith, who has played well this season after a strong finish last season, but I believe Alabama's best lineup this season is a small lineup. I thought that was on full display Friday, and I hope that's what we see more of going forward. The way the game is going, the traditional lineup of having two post players on the floor is fast becoming anachronistic. These days, you have to have four (or even five) guys on the floor that can score from multiple spots on the floor, and can guard multiple spots on the floor. Marshall is a great coach, and the Shocker fans are going to outnumber Bama fans, but I think Alabama is the more talented team in this matchup. That doesn't mean they'll win of course, particularly if we see a repeat of Thursday's performance, but I'm going to believe that Alabama figured out some things in the Ball State game that they can further explore in this one.